A Regular Meeting of the San Benito County Republican Central Committee will be held on Thursday, January 24th, 2019, 7:00 PM. The meeting will be at the offices of the Veterans’ Memorial Building 649 San Benito Street, Hollister, CA 95023. Test your presidential skills. 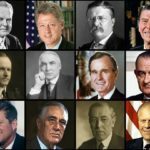 Can you name the presidents of the United States of America? Be a part of this important social movement and participate in building a better future! Join this historical republican party and stand up for the values that make San Benito great. Let’s unite and make a difference together!